We are both humbled and proud as we reflect back on the risks and hardships taken by a young, eager 17-year-old immigrant, whose vision led to the path we are on today. The stories and photos gathered in this book are a wonderful reminder of how a dream can become a legacy—one that we cherish now and in future generations. As second generation family entrepreneurs, our goal is to pass on the teachings and values that have shaped us to our children—our future. In 1959, Lou Biffis, a recent young immigrant from Italy working in construction in Toronto, first set foot on the property outside of Alliston, Ontario that today is home to the family’s world-renowned Nottawasaga Inn Resort, named after the river that runs through the property. After clearing the land, building a bridge across the Nottawasaga River and winning a bet with a friend over a bottle of Canadian Club whiskey that he would be able to obtain a liquor license in the township that had been dry since 1907, Lou Biffis, together with his late brother-in-law, Mike Lombardi, built the original Inn on the property. The Nottawasaga Inn opened its doors in 1968. Today, Lou’s vision has resulted in a state-of-the-art 269-room resort with 45 holes of golf, a 70,000 square health and fitness centre, a two-pad NHL hockey arena, a world-class soccer field, 36 conference rooms including three ball rooms, as well as three restaurants. Jointly led by Lou and his children and nephew, the Nottawasaga Inn Resort, together with the family’s other ventures in land development and philanthropy, continues to play an instrumental role in the transformation of the entire area. The Nottawasaga Inn Resort was approaching its 50th anniversary when the Biffis family invited us to capture the story of Lou Biffis, Cable Bridge Enterprises and their award-winning Nottawasaga Resort in the form of a classy coffee table book to be launched at the main 50th anniversary reception. The goal of the second generation was to give their father, company founder Lou Biffis, the opportunity to tell the story of their family business, together with friends, business partners and other stakeholders who had been part of the journey from early on. Equally important, the Biffis wanted to recognize the contributions of their long-time employees, many of whom had been with the Resort for 20, 30 and even 40 plus years. 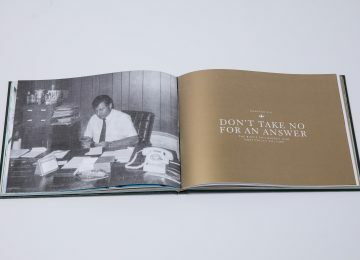 The book was to be launched at the a special 50th anniversary reception at the Resort. 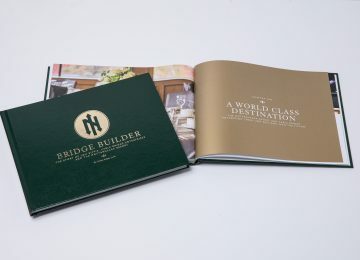 Authored by Dr. Ulrich Frisse and designed by Lesley Warren Design Group, Bridge Builder—The Story of Lou Biffis, Cable Bridge Enterprises and the Nottawasaga Inn Resort—tells the story of Lou Biffis and the family’s enterprises and philanthropic ventures going back to their roots in Italy. Joint interviews with the founder and long-time stakeholders created a comfortable environment in which Lou and his friends, business partners and long-time employees enjoyed reminiscing together. 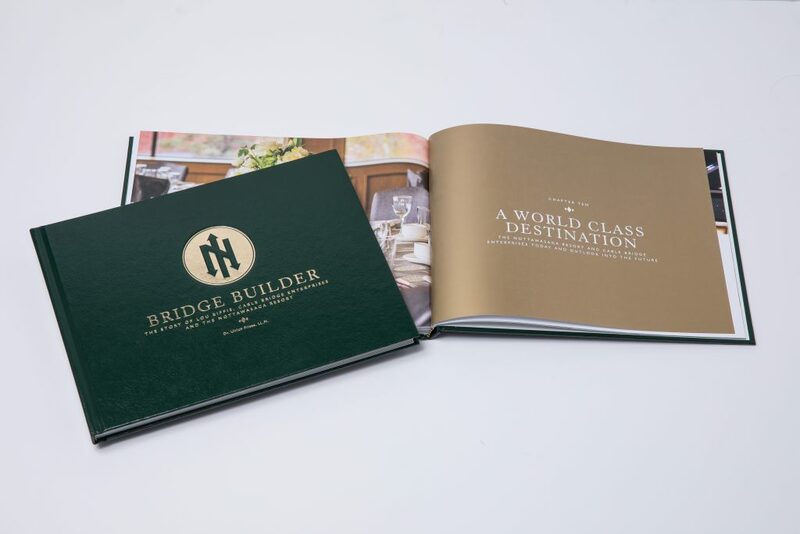 Through these conversations, the main themes of the story evolved—the vision and passion to create an exceptional hospitality experience and a strong sense of family that is extended to employees and guests alike. 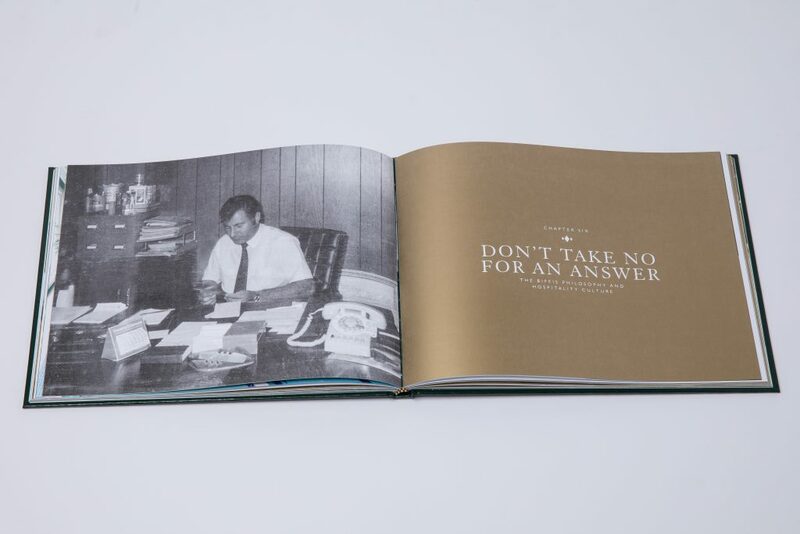 While following the story of Lou, the Biffis family and the Nottawasaga Inn Resort, the narrative zooms in the founder’s foundational beliefs as a person and entrepreneur who does not take no for an answer. Special attention is given to the impact his upbringing in the most modest of circumstances had on his trajectory as an entrepreneur, as well as the importance of family and making a difference in the community. 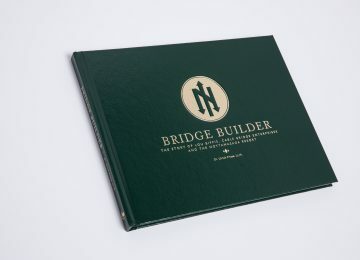 The book’s title is a play on the fact that the story of the Nottawasaga Inn Resort began with the building of a physical bridge across the Nottawasaga River and the matching metaphorical image that over the course of 50 years, Lou and the Biffis family has built countless bridges with guests, employees and members of their community.